Where did Easter and its customs come from? The Bible doesn’t mention rabbits or eggs or sunrise services. So what is the origin of Easter? Since Easter is one of the most renowned holidays in the Christian world, why should we be concerned about the origin of Easter? For centuries, questions have arisen as to the relationship between bunnies and painted eggs and the resurrection of Jesus Christ. The truth of the matter is that Easter has its roots in ancient paganism and polytheism. According to William E. Vine, “The term ‘Easter’ is not of Christian origin. It is another form of Astarte, one of the titles of the Chaldean goddess, the queen of heaven. The festival of Pasch [Passover] held by Christians in post-apostolic times was a continuation of the Jewish feast. … From this Pasch the pagan festival of ‘Easter’ was quite distinct and was introduced into the apostate Western religion, as part of the attempt to adapt pagan festivals to Christianity” (Vine’s Complete Expository Dictionary of Old and New Testament Words, 1997, “Easter”). 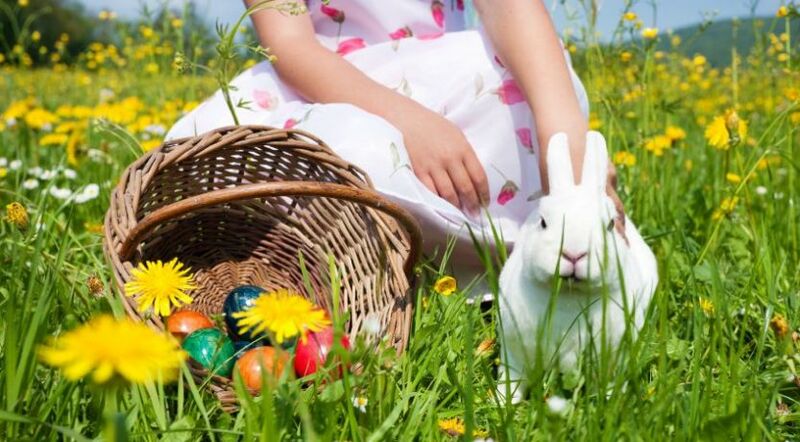 “The association of Easter practices with the pagan goddess Eostre makes clear some of the traditions that are carried out today. The goddess Eostre was honored toward the end of the month of March, right around the time of Spring Equinox” (HistoryofEaster.net). Another source describes a possible ancient link to Good Friday: “In ancient Roman history, the 24th of March (VIII Kal Apriles) was the Dies sanguinis ‘day of blood,’ possibly a precursor of Good Friday. On the 22 of March, the arbor intrat, a procession of palms or a pine tree was brought to the shrine of Cybele. Two days later, at the Day of the Blood, the priests of Cybele slashed themselves and spun around to sprinkle her statue with blood” (AncientHistory.About.com). “The pagan celebrations most associated with modern Christian practices derive from Mediterranean cultures. The Phrygians celebrated a spring festival honoring Cybele, a fertility goddess. Cybele had a consort god named Attis, who was born of a virgin, and who died and was resurrected after three days, an occurrence commemorated sometime around the vernal equinox. Worshippers of Attis mourned the god’s death on Black Friday, then celebrated his rebirth on the following Sunday. There are hundreds of other websites that discuss the pagan origin of Easter. So, what is a Christian to do with the knowledge of the pagan origin of Easter? According to the Bible, God does not want His people to follow or seek after pagan customs. When ancient Israel entered the Promised Land, God warned them not to seek after the teachings and traditions of the nations that once inhabited the land. He said, “Take heed to yourself that you are not ensnared to follow them, after they are destroyed from before you, and that you do not inquire after their gods, saying, ‘How did these nations serve their gods? I also will do likewise.’ You shall not worship the LORD your God in that way; for every abomination to the LORD which He hates they have done to their gods” (Deuteronomy 12:30-32). Later, Christ told His disciples: “Well did Isaiah prophesy of you hypocrites, as it is written: ‘This people honors Me with their lips, but their heart is far from Me. And in vain they worship Me, teaching as doctrines the commandments of men.’ For laying aside the commandment of God, you hold the tradition of men” (Mark 7:6-8). Therefore, anything that has pagan origins must be avoided by Christ’s disciples, no matter what the intent or long-standing tradition. It is also important to note that the Bible nowhere tells us to honor the day of Christ’s resurrection. Instead, God established a command that the Passover should be observed annually to honor Christ’s death. Today, Christians are not to participate in the Easter holiday, but rather in the New Testament Passover, which is the memorial of Jesus Christ’s sacrifice for our sins. In great solemnity, once a year on the 14th day of the first month on the Hebrew calendar (Leviticus 23:4-5), we are to observe the Lord’s Passover. On that special evening, the apostle Paul instructed the members of the Church to partake of the bread, which symbolizes Christ’s body broken (beaten) for us, and to drink of the wine, which symbolizes the New Covenant in His blood (1 Corinthians 11:23-29). As to Christ’s resurrection, this occurred exactly three days and three nights after His burial (Matthew 12:39-40; Luke 24:46-47). Christ was crucified on a Wednesday afternoon, buried just before sunset, as Thursday was an annual holy day. He was resurrected three days later on Saturday afternoon (the weekly Sabbath) just before sunset. It must also be noted that on the first day of the week, Mary Magdalene had come to the tomb while it was still dark. Christ had already risen—long before sunrise (John 20:1-2). So, the story of Christ’s resurrection occurring on Easter Sunday morning (as well as rabbits laying eggs) is a polytheistic myth. Instead of observing Easter or any of its customs, Christians are instructed to observe the biblically authorized holy days of God. Easter in the Bible? Translation Error!